It might sound hard to believe, but some people start to feel a little dissatisfied with their retirement life after the initial honeymoon is over. After all, retirement can last a long time and that is way too long to just sit around watching television and catching up on your sleep. It is compounded by the fact that many of these bored retirees are unprepared to take on the responsibilities of filling their days with meaningful activities. That, and because they have spent their entire lives working, raising a family and keeping extremely busy all of the time, there is a big void to fill upon retirement. While having a blank calendar might sound great when you are over-scheduled, it is a rather sad scenario when you have nothing to look forward to. And without a reasonable amount of challenges, newness and variety, retirement can turn out to be far less spectacular than you had hoped. You worked hard for many years to reach retirement, it should be all that you expect it to be and not a trip down boredom lane. Your New York Medicaid planning service offers some ways in which you can keep from getting bored in your retirement. When you retire, you will discover that you have a whole lot of free time; more free time than you have ever had before. You may choose to use this extra free time to spend some quality time with friends and family getting to know then even better. If you choose to stay at home and talk to nobody, you will grow bored. Use the time you have to strengthen the relationships you already have and to renew old ones that have been non-existent for quite some time. It would even do you a world of good to do out and meet new people and make new friends. Without a doubt, as you age your interests will change. It is a good idea to branch out and meet new people who share your interests and ideas. And with social media, meeting new people is as easy as clicking a mouse button or swiping left. Nobody wants to find themselves mired in a dreadfully boring routine without anything to look forward to. Sometimes retirees feel safe in their homes and are reluctant to get out, this often leads to laziness and boredom. Don’t let retirement reach this level by challenging yourself. Going back into the real world and experiencing new things helps keeps your life fresh and interesting. These new experiences may require new skills and developing these skills is critical if you wish to stay sharp and on top of your game. Just because you aren’t as strong or nimble as you once were, this doesn’t mean you need to spend your retirement doing nothing and feeling sorry for yourself. You should be safe and take it easy when trying something new, but you still need to give it an effort. Allow yourself to look back into the past and embrace the feelings of nostalgia that are associated with seeing your life in a broader perspective. Close your eyes and go back to a time when you were young and vigorous, when you felt alive and life had more meaning. In fact, break out the vinyl records, slap some Bob Dylan on the turntable, break out the old photos and reflect on your youth. Remember the dreams and ambitions you had in the past and let them help you feel good about the present. Nothing shakes off boredom more quickly that when you discover a sense of purpose. Now is the perfect opportunity to explore interests and passions that you may have had in the past, but never acted upon. Let’s start with what inspires you and then take the necessary steps to reach that goal. It might be taking up the flute or painting a picture or learning a new language, whatever it takes to keep yourself busy. 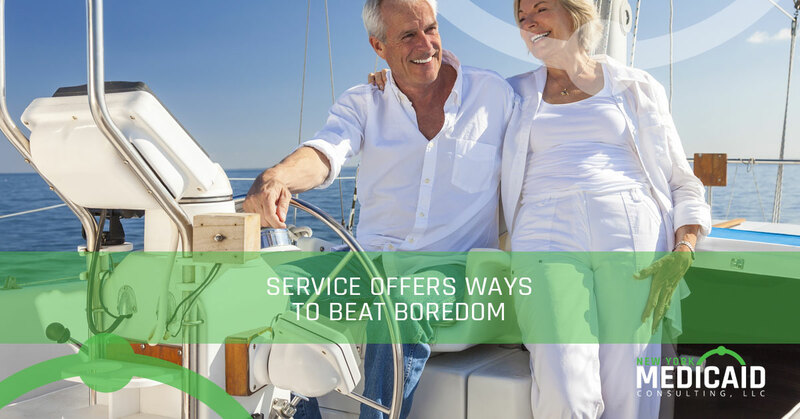 Boredom is dangerous and its destructive nature can affect your health. New York Medicaid Consulting is dedicated to providing the highest quality planning services. Contact us for more details.